1.Roast the peanuts in a sauce pan. 2. Remove the peanuts and let it cool down before chopping or smashing them to smaller size. 2. In a medium high heat on the same pan combine condensed milk, flour and sugar. 3. Keep stirring the yema until its yellowish color but not golden brown. Usually takes 5-10 mins of stirring depends on the pan you are using. 5. Turn off the heat and keep stirring for a minute or two to prevent the bottom of the yema to burn. 7. 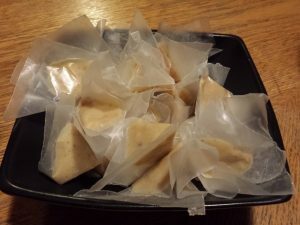 Let it cool down on the pan and while waiting cut up a wax paper 3×3 inches wide. 8. Let the yema get totally cooled before wrapping it on a wax paper. 9. Put it on the fridge or in jar on a cold room.This can last for 7 days. Enjoy your Yummy Yema!